For the month of June, the UGDSB Board Office will fly the Pride flag. Schools that wish to may also fly the Pride flag, in accordance with board Policy 310 – Display of Flags. What is the Pride flag? Rainbow flags have existed in many configurations representing many peoples and experiences throughout human history. The current Pride flag’s exact colours and dimensions have changed from the Gilbert Baker flag, which first appeared as a representation of the LGBTQ+ community in 1977. 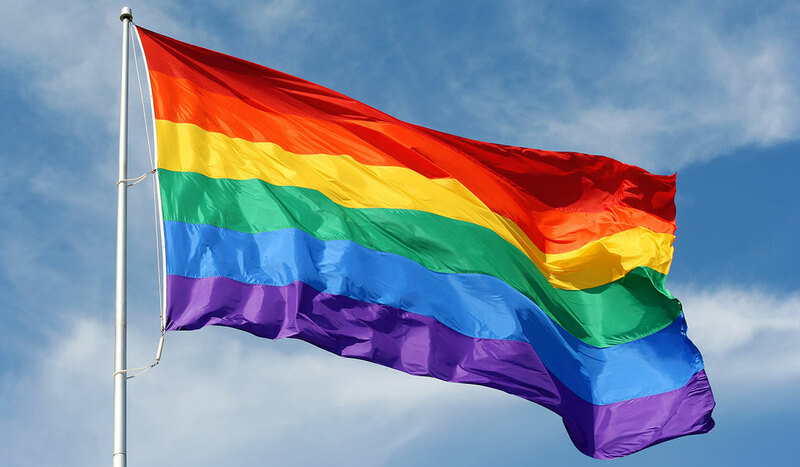 Although the Rainbow flag is still strongly connected to the LGBTQ+ community, it also is a representation of social change cited as being a symbol of hope and peace. LGBTQ+ refers to Lesbian, Gay, Bisexual, Transgender, and Queer or Questioning. The + refers to people who identify as Intersex, Asexual or an Ally. There are specific flags and flag variations for many identities within the LGBTQ+ community. Why is my child’s school flying the Pride flag? The month of June is Pride month. Many of our students, staff, parents/guardians and community members identify as members of the Rainbow or LGBTQ+ community. Flying the Pride flag not only signals that our schools are safe spaces for everyone, it also aligns with our Vision Statement and Guiding Principles of inclusion and student and staff well-being and our new Equity Plan. Our school district is showing our acceptance and celebration of the LGBTQ community during Pride month by raising the Pride flag at schools and offices across the UGDSB. We continue to raise awareness and support inclusion and acceptance of other marginalized groups in other ways. Some examples include our Poverty Challenge initiative aimed at increasing awareness of socio-economic disadvantage, the One Voice One Team initiative aimed at creating community for racialized students, supporting persons with disabilities by making our schools more accessible, and by acknowledging the original people of these lands. We continue to work to ensure the equity and inclusion of all our students and staff. Students will attain individual excellence through dynamic programming provided by an effective staff and supported by a committed community. We will meet our students’ diverse needs through the provision of equitable and accessible resources. Our learning environment will be characterized by empowered administrators, effective communication and mutual compassionate respect. What if the flying of the Pride flag is against my personal values and beliefs? We believe that our schools are safe spaces for everyone. Everyone has the right to be treated with dignity and respect. Additionally, regardless of your personal values and beliefs, we all must follow the Ontario Human Rights Code that protects marginalized groups from discrimination and harassment. We are flying the Pride flag to demonstrate our commitment to our community that discrimination and harassment of any kind will not be tolerated in our board. What are the rules around flying flags in Canada and in the UGDSB? The Government of Canada indicates that the manner in which the Canadian flag is displayed in Canada is not governed by legislation. The rules applied by the government are not mandatory for individuals or organizations, they simply serve as guidelines. Before making the decision to fly the Pride flag, we checked in with the Government of Canada’s flag protocol lead at Heritage Canada. They confirmed that where schools only have one mast it is a pragmatic workaround to show our support and inclusion of the LGBTQ+ community by flying the Canadian flag first, with the Pride flag beneath. The UGDSB has specific procedures that all schools must follow to request permission to fly a flag (in addition to the Canadian flag) outside of the school. These procedures are outlined in Policy 310 – Display of Flags. UGDSB Policy 310 – Display of Flags allows for the display of other flags under specific parameters. The information below and available at the following link explains the policy and processes related to the flying of flags in our board. How are schools discussing the Pride flag and LGBTQ+ issues? Each of our schools is committed to providing its students with a positive school climate. We know that when students feel safe and supported in a healthy school climate, they have greater success. Through board specific initiatives as well as the province’s Well-Being Strategy and Equity Action Plan we are committed to creating the healthy, positive spaces in schools that our students need. Many of our high schools and elementary schools have Gay Straight or Gender Sexuality Alliances (GSAs) and Equity clubs. These clubs are safe spaces for our students, staff, and allies of the Rainbow community to come together and discuss issues they may be facing and topics that matter to them. Our GSAs and Equity groups are places that our students feel comfortable being themselves and can take action in supporting the equity of all people. In our elementary schools, through the Health and Physical Education curriculum, students learn to understand and respect things that are the same and different from each other. This includes that not every family looks the same. Some families have a mom and a dad, some just have a mom or a dad and some families have two moms and two dads. What supports are available to staff and students in schools regarding LGBTQ+ issues? In addition to our GSAs and Equity groups, all of our schools in both Elementary and Secondary have an Equity and Wellness Teacher Representative as a contact and support for their schools. For several years, the board has offered Egale and Harmony training to our staff to support their knowledge. School Administrators have also had equity-based training and are aware of our UGDSB 3-Year Plan in accordance with Ontario’s Education Equity Action Plan. How do I talk to my child about what it means to identify as gay or transgender? Since everyone parents in different ways, it is difficult to answer this question. You will know best on how to speak to your child about accepting and including people who identify as LGBTQ+. For elementary aged children, we suggest focusing your discussion on love and relationships and explain that people love each other in different ways. When talking to children about people who identify as transgender, explain that in their head and their heart, they feel that they are a boy, girl or combination of those traits. Sometimes it takes a person more time to be comfortable to express themselves as who they really are and sometimes how people express themselves changes over time. These books can be found in many of our school libraries as well as our local public libraries. The Human Rights Campaign in the United States has a guide for parents on discussing LGBTQ+ issues with students. Who can we contact with questions or concerns? Please contact your child’s school administrators with questions or concerns.